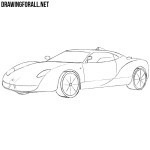 At first sketch out the general outlines of our Ferrari. 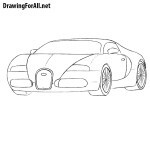 First draw the car body and then the roof with a curved line. 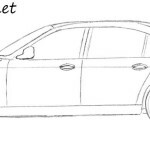 Outline the long and angular headlights, the lines on the hood and the lines of the radiator grille. Sketch out the lines of the windows and the side mirror. Draw the round wheels and move to the next step. In this step we start adding details. Drawn details of the grille which is divided into three parts. We continue drawing a Ferrari. Carefully draw out the headlights, draw the lines on the hood and the emblem of the Ferrari. Using smooth and curved lines draw the roof and the lines of the windows of the Ferrari. Draw out the mirrors. Draw out the lines on the body of the Ferrari, lines of the door and the fuel cap in the rear part of the car. 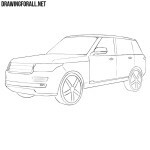 Draw out the wheels and rims, which can be of any shape that you want. 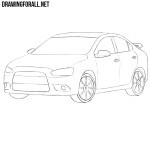 We have only to add shadows on the car’s body and the cast shadow with the help of usual hatching. Drawing lesson on how to draw a Ferrari is over. If you want a Ferrari but do not want to suffer with auto insurance for such an expensive car, then just draw it. And also visit our other car lessons, and share this lesson with your friends. 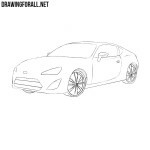 lit car drawing it right now the hardest thing is getting the base drawing right. I got it pretty nice. Thanks, love it soooo much. Turned out great! you did not expain thoroghly !!!!!!!!!!!!!!!!!!!!!!!!!!!!!!! !